Car crashes are an intense experience, even when they occur at slower speeds. If you watch a 30 mph collision from a distance, it may seem insignificant. But the force that acts on your body, even at lower speeds, is anything but small. That’s why many people who believed they were “fine” at the scene of the accident may be surprised to feel pain or discover injuries in the hours or days after the wreck. If you develop soreness or pain in the days following an accident, what should you do? 1) Do not ignore pain or other symptoms that develop after you’ve experienced a car crash. The idea that a person must feel any accident-related injuries immediately after the car wreck is simply not true. Some injuries, like broken bones, will be immediately apparent. But the human body experiences a significant amount of force and stress during a collision. It can take hours or even days to truly feel the effects. A severe or persistent headache. This may indicate any number of injuries, including concussion, neck injuries, whiplash, or a traumatic brain injury. Neck, shoulder, or back pain. Whiplash is a common “catchall” term for soft-tissue injuries. It’s caused when your head “whips” forward and back during the impact. Whiplash injuries may require medical treatment or therapy and can lead to chronic pain if not addressed. Tingling or numbness. You could have a herniated disc or other spine injury. Abdominal pain. Internal bleeding is always a possibility after an accident and could be life-threatening if left untreated. Clouded thinking, blurred vision, or nausea. These symptoms point to a possible concussion. Your brain is usually cushioned and protected inside your skull, but a sudden force (like a car crash) can cause your brain to strike the side of your skull. While this is a common injury, it can be a very serious one. 2) Seek medical attention as soon as possible. It’s always wise to see a doctor immediately if you’ve been the victim of a car accident. But even if you chose to forego an ER visit the day of the crash, you should schedule an appointment as soon as you begin feeling pain. A medical professional will be best able to determine whether your injuries are serious. He or she will prescribe medicine, treatment, or further tests. You’ll also need medical documentation if you file an injury claim after the accident. Timing is important; if you wait too long to seek help, an insurance adjuster may argue that your injuries are manufactured or unrelated to the wreck. 3) Do not agree to any settlements or sign waivers until your injuries are fully resolved. Insurance adjusters often try to settle your case as soon as possible. If you sign a waiver or agree to a settlement before you’ve been released by your doctor, you will not be able to get compensation for any further medical treatment, even if a serious injury emerges. Learn more about handling eager insurance adjusters here: What To Do If Insurance Tries Settling the Day After My Accident. 4) Contact an experienced personal injury lawyer. Unfortunately, the longer you wait to seek medical treatment, the more difficult it will be to make an injury claim with the insurance company. A personal injury attorney can help strengthen your claim. He or she will negotiate with adjusters and ensure you are not unfairly penalized for the delayed onset of your injuries. A lawyer will also help ensure you’ve achieved “maximum medical improvement (MMI)” before beginning settlement discussions with the insurance company. This is the point at which your doctor determines that you have reached full recovery, or that your condition has stabilized and will not require further treatment. It’s important to wait for your doctor’s release. If you were injured in a car accident and another driver was at fault, you may be entitled to compensation for your medical care, lost wages, pain and suffering, and more. Taylor King Law has decades of experience in dealing with insurance adjusters and will protect your rights to a fair settlement. You’re one call away from getting help today. Call us at 1-800-CAR-WRECK (227-9732) or visit our website to submit a free case evaluation form. 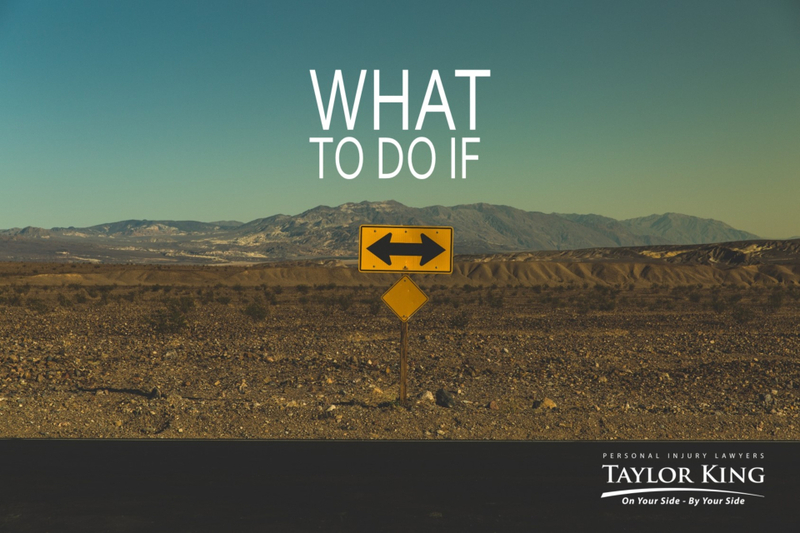 When you hire Taylor King Law, you get a statewide team of expert attorneys who will be On Your Side, By Your Side.